Columbia Crest Crowdsourced™ Cabernet Sauvignon - Write for Wine: It's Wine O'Clock Somewhere!Write for Wine: It's Wine O'Clock Somewhere! Three years ago Columbia Crest became the first winery in the world to crowdsource a wine through an interactive experience with wine enthusiasts. Led by Juan Muñoz-Oca, Columbia Crest’s head winemaker, voters made decisions on every step of creating the wine — bud break, harvest, fermentation, the blend and the label. For the grapes, Muñoz-Oca chose a five-acre estate block in one of his best vineyards, which is used for his highly acclaimed reserve program. 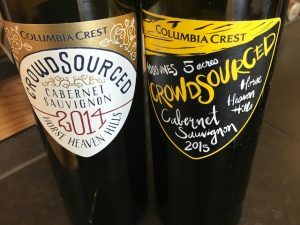 2014 Crowdsourced™ Cabernet Sauvignon was released in June 2016, and was followed by 2015 Crowdsourced™ Cabernet Sauvignon one year later. One thousand cases of each wine were produced; both retail at $30. While the two vintages have similarities, there are also some distinct differences, as we noticed when we recently held a side-by-side tasting. You can do the same by buying both vintages on their website. And you’ll also receive a discount. Another difference resulted from 2015 being one of the warmest growing seasons on record in Washington state. The wine has a bouquet of red berries, herbs (from the Cab Franc) and barrel spice, followed by flavors of dark chocolate and dark berries. This is a bright Cabernet Sauvignon, which was a bit tight when we opened the bottle. But after some decanting, the flavors and texture developed into one tasty sip after another. This inaugural vintage was also sourced from Horse Heaven Hills, but sat 16 months in 30% new oak barrels prior to bottling — compared to 12 months in 60% new oak barrels for the 2015 release, as mentioned. And while the 2014 vintage was warm, the temperatures were not quite as high as in 2015. The 2014 blend of Cabernet Sauvignon (87%), Malbec (7%), Petit Verdot (4%) and Merlot (2%) obviously would result in different aromatics and flavors than the 2015 blend of Cabernet Sauvignon (80%), Merlot (10%) and Cabernet Franc (10%). This wine opens up with aromas of black tea, blackberry and dark cherry, followed by flavors of dark fruit, toffee, coffee and anise. We first tasted this wine soon after its release, and were delighted to see how much the flavors developed over one year. Thanks to Columbia Crest for sending us samples, which we thoroughly enjoyed. This entry was posted in Cabernet Franc, Cabernet Sauvignon, Horse Heaven Hills, Malbec, Merlot, Petit Verdot, Washington, Wine and tagged Cab Franc, Cabernet Sauvignon, Columbia Crest, estate wine, Malbec, Merlot, Petit Verdot, Washington wine, Washington wineries, wine, wineries by Margot. Bookmark the permalink.